Well well well Mr. Burton, this I did not expect. 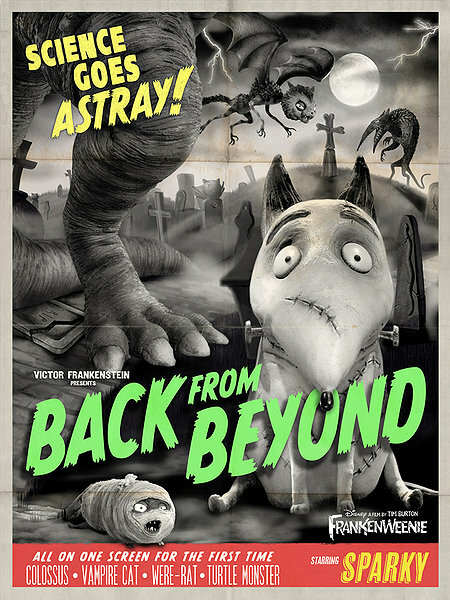 Frankenweenie is perhaps the finest animated film I’ve seen this year, or in recent memory. The story follows a young, clever and introverted child by the name of Victor Frankenstein (Charlie Tahan) and his faithful dog Sparky. Tragedy strikes when Sparky meets his maker in an untimely fashion, but after some sadness, Victor uses his superior intellect to resurrect Sparky through the use of lightning and electrodes. It’s alive… IT’S ALIIIIIIIVE!! Ok, so it sounds like Frankenstein, but with a dog, as opposed to a human. And therein lies the genius of this film: it’s very referential to horror and sci-fi films that have gone before it. Whether it’s a toilet scene bringing to mind that of Jurassic Park, the naming of characters such as Victor Frankenstein, Edgar “E” Gore or Elsa Van Helsing, or even the inclusion of footage from Horror of Dracula with Christopher Lee. It’s all there. And there’s probably a hell of a lot of stuff that I didn’t spot. This is a true Easter Egg hunt for horror purists. Search and you shall find. Although you could probably fit the plot of Frankenweenie on the back of an envelope, it’s told incredibly well. The characterisation is fantastic and definitely Burton. This would normally put me off, but not here. He’s gone back to his roots and brought out that spooky and odd writing of old. All of this is rounded off with true off-the-wall humour that made me think of Mars Attacks! more than anything else. In saying this, I didn’t hear a single child laugh over the course of the movie. Now, I said that ParaNorman had the same issue, but kids did laugh – at physical comedy. Frankenweenie is a much more solemn affair and the humour is aimed squarely at a more mature audience. The film looks beautiful, which will entertain the children, but it won’t have them laughing and squealing with delight. It may therefore be suited to a more intelligent child. But everyone thinks their kid is a genius right? But if you’re being honest with yourself, does your child enjoy being creative and painting vivid scenes with poster paints? Or does he/she simply just mix all the paints into a brown mess and claim it’s a “bunny wabbit”. That child wouldn’t suit this film. Sorry. You child isn’t a genius. But I hear Madagascar 3 is incredibly funny…? Back on track: I mentioned the visuals. Obviously the first thing that strikes you about the film is that it’s in black and white – all of it. Don’t expect the colour to appear somewhere. I read that Burton was set on having his world shown in this way. It’s a brave move, but it really works. 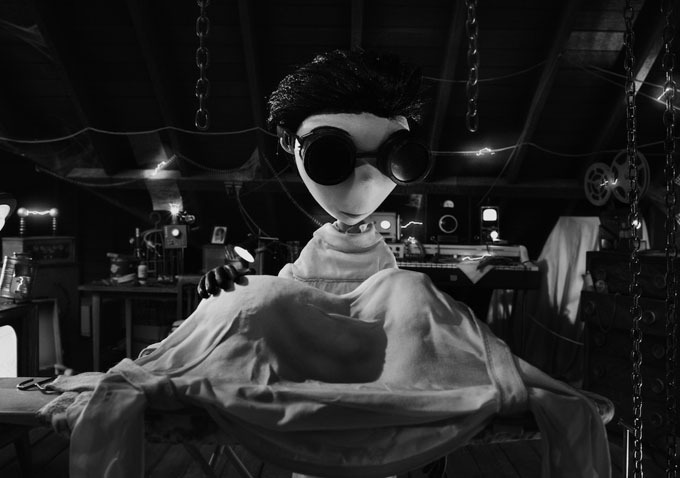 I can’t help but feel that The Artist‘s success made film companies a bit more interested in the nostalgic approach to film making, but regardless – it’s certainly helped Frankenweenie. And the animation? Flawless. All of the characters are very “Tim Burton” – big heads, massive eyes and odd teeth. It’s very stylised and stylish. I loved it. Ultimately, I couldn’t get enough of this film. Some of my US-based critic friends. notably Keith & The Movies and Papa Kenn Media (check them both out) had alerted me that this might need to be seen and I wasn’t disappointed. As I said at the outset, I’ve never been a Tim Burton fan. I think his reliance on casting Johnny Depp and Helena Bonham-Carter in everything put me off somewhat. That and the fact that he hasn’t had an original film idea in a good while now. This changes all that. Although I still won’t be signing up for that fan club, I can wholeheartedly say that this film is fantastic. Thoroughly engaging and true eye candy, with enough horror-centric references to sate old school horror fans, as I’m sure Burton himself is. So Mr. Burton it seems I owe you an apology. Well, not an apology… an admission. 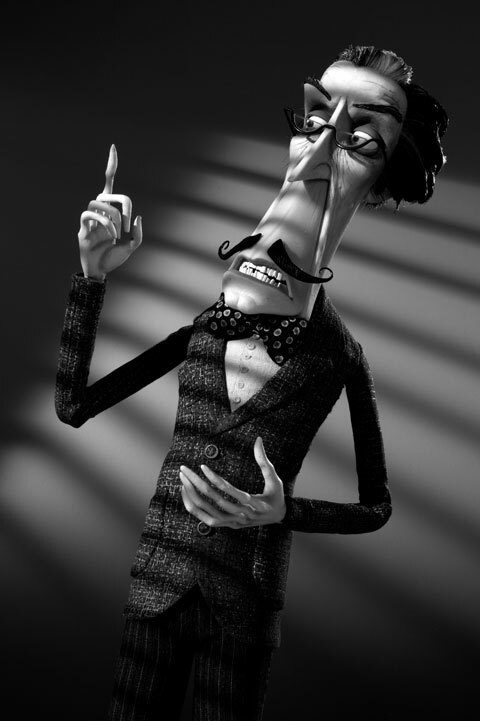 Although I think the vast majority of your work is forgettable and ultimately underwhelming, I loved Frankenweenie. It really struck me as a lovingly put together film that really drew upon all of your inspirations as a child. Also, thanks for not casting your wife or Johnny Depp (your other other half) in this film. No disrespect to them, but it made the film so much more refreshing without them. Might I make a recommendation to you though? Let’s not reanimate the corpse of Frankenweenie. I don’t want to see Frankenweenie 2: Revenge of the Felines. 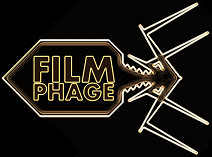 I think it should stay buried, and not in the Pet Sematary, because we all know what happens there too… Cheers, The Phage. This entry was posted in Review and tagged black and white, cartoon, Frankenstein, Frankenweenie, Gremlins, Hammer Horror, horror, Jurassic Park, stop-motion, Tim Burton, Van Helsing. Bookmark the permalink. Good review. It’s one of those movies that Burton obviously had the best time making and makes you feel as much passion for the material as he does. Yeah, it’s really been a long time coming now. Hopefully he’ll continue making movies in the same way and not cave in to redoing / rehashing a story that doesn’t need to be retold!